The GladiATR Vision™ is a novel sampling tool which couples small area infrared analysis with simultaneous viewing. Samples are placed face down and positioned on the diamond crystal while its image is projected in real-time on the LCD screen. Finding and optimizing the sample placement for specific analysis areas is easy and fast! IR beam and visible illumination meet at the sample position. The GladiATR Vision™ is a novel sampling tool which couples small area infrared analysis with simultaneous viewing. Samples are placed face down and positioned on the diamond crystal while its image is projected in real-time on the LCD screen. Finding and optimizing the sample placement for specific analysis areas is easy and fast! 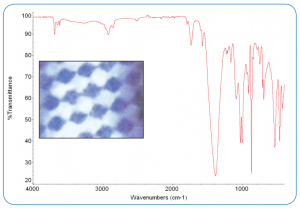 Analysis of thick or non-transparent samples is no problem because viewing is through the diamond crystal. 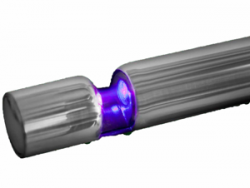 The GladiATR Vision accessory utilizes an innovative optical design with IR beam and visible optical image converging at the sample position – ensuring that “What you see is what you sample!” The 110X magnification of the sample image enables the positioning of even relatively small samples into the center of the diamond crystal for optimized analysis. 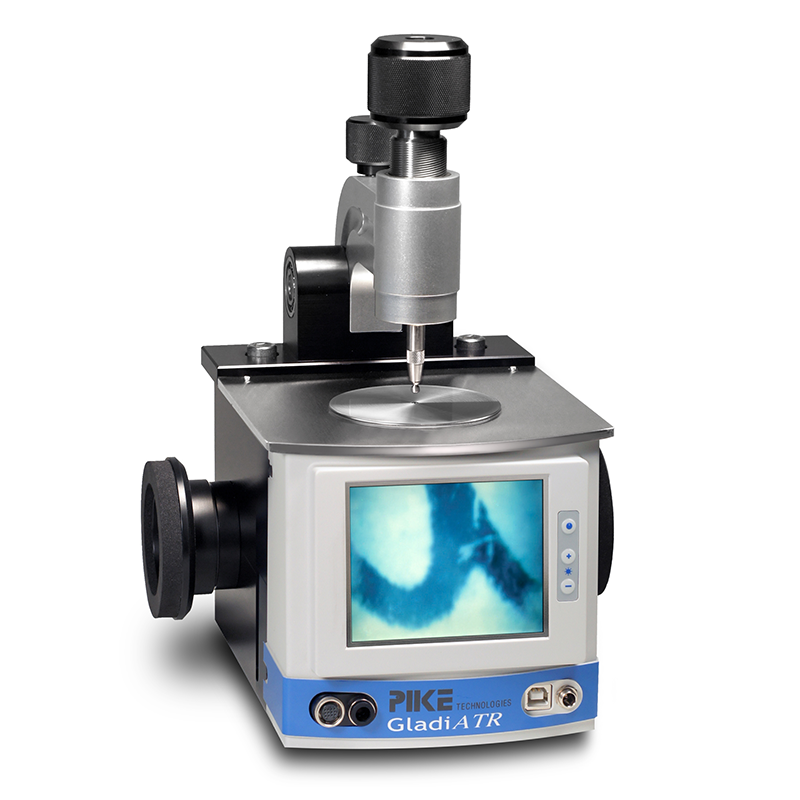 Analysis of samples as small as 50 microns in size is doable with the GladiATR Vision accessory. Visible images from the GladiATR Vision are of highest quality color rendition because its refractive optics are fully transparent. The GladiATR Vision optical design is all reflective, preserving the full spectral range inherent to diamond. For standard mid-IR FTIR spectrometers, the spectral range available with the GladiATR Vision will be 4000–400 cm-1. 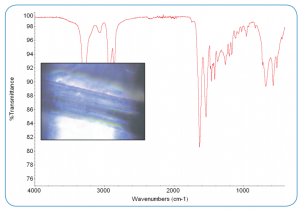 For FTIR spectrometers equipped with far-IR optics, the spectral range is extended to less than 50 cm-1. diamond crystal. Image of the analysis area is shown in the inset. ATR spectrum of 200-micron fiber run on GladiATR Vision with diamond crystal. Compressed fiber image is shown with the spectrum. Temperature controlled crystal plates are available for thermal study of materials. The resistively heated diamond Vision plate has a temperature range from ambient to 210 o C. PIKE Technologies offers temperature controllers with digital and PC programmable set points with TempPRO software, which allows for easily programmed temperature profiles and data collection by interfacing with most FTIR software platforms. For applications requiring temperatures from subambient to 210 o C, liquid jacketed plates are available. The viewing specular reflection plate transforms the GladiATR Vision into a 45 degree specular reflection accessory, uniquely allowing the sampling spot, such as a defect, to be easily located. 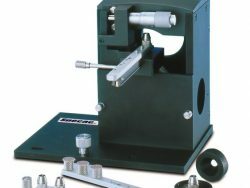 With the small spot size of 3 mm, you can be confident of your sampling point. The GladiATR Vision diamond ATR is available in configurations to fit most FTIR spectrometers.